Guaranty: Within 90 days product quality is not completely satisfied, please CONTACT US, 100% refund. sharp cutting edge, milling, hole and plate edge, surface clean, neat, no glitches. PCB, SMT, CNC, Mould, plastic fiber, carbon fiber, super hard wood, printed circuit board, other precision parts processing. Use of ultra-fine grain carbide material with good milling, cutting performance, ensure high work efficiency. High hardness, high wear resistance, high strength. Have sufficient bending strength and wear resistance. 1/4 Inch Diameter Solid Carbide End Mill - Long 1/4" Shank 1" Length of Cut 4" Overall Length 4 Flute Carbide - Long. 1.Four flutes produce a better finish than fewer flutes. 2.Material: HSS ; Imperial Units, not Metric . 4.Hardness of metal for above HRC 45 degrees,with high bending resistance and abrasion resistance, exclusive to HIGH HARDNESS, HIGH SPEED CUTTING applications. 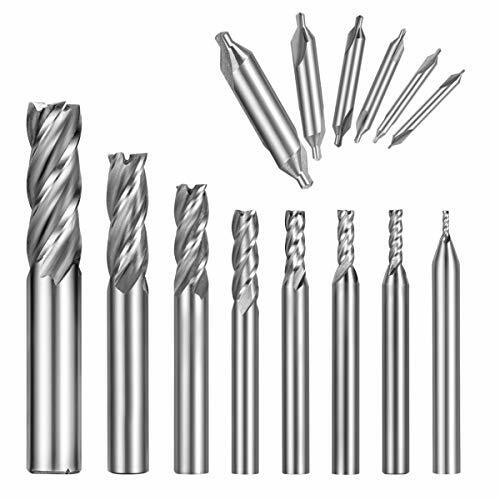 5.End mill bits are suitable for side milling, end milling, finish machining, etc. Apply to carbon steel, alloy steel, die steel, tool steel, cast iron, titanium, aluminum, etc. 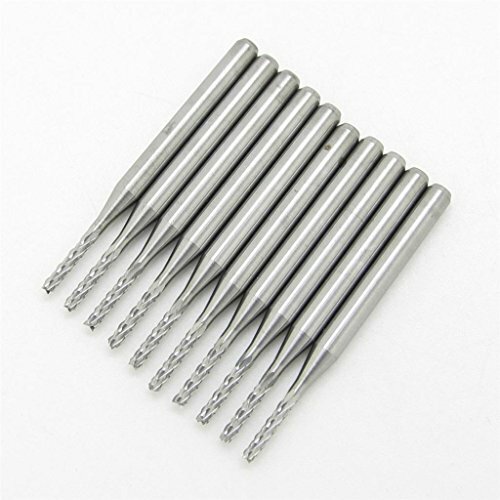 20 piece TiN coated HSS end mill set includes both 2 fluet and 4 flute end mills. 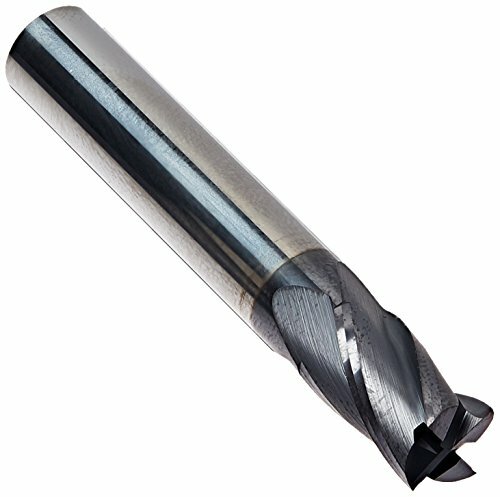 The 3/16" through 7/16" end mills have a 3/8" shank. The 1/2" and 9/16" end mills have a 1/2" shank. The 5/8" and 11/16" end mills have a 5/8" shank. 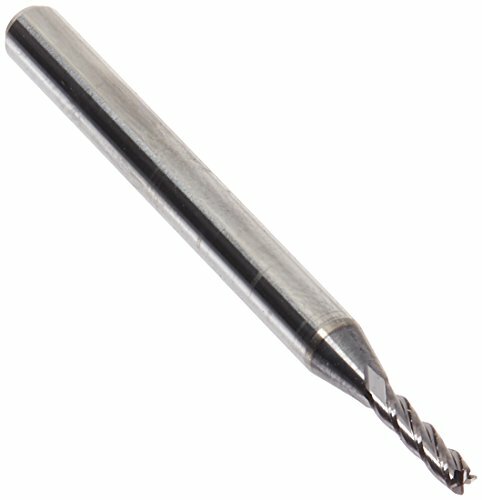 The 3/4" end mill has a 3/4" shank. The set comes in a fitted case. SPECIFICATION: * Material: Cemented carbide with titanium plating * Shank Diameter: 3.175mm * Overall Length: 37mm * Cutting Edge Length: 12mm * Shank Diameter: 3mm (0.118 inch) * Cutting Edge Diameter: 0.8 - 3.175 mm (0.8, 1.0, 1.2, 1.5, 1.6, 1.8, 2.0, 2.4, 3.0, 3.175 mm) FEATURES: 1. Use of ultra-fine grain carbide material with good milling, cutting performance, ensure high work efficiency. 2. Have sufficient bending strength and wear resistance; High hardness, high wear resistance, high strength. 3. Sharp cutting edge, milling, hole and plate edge, surface clean, neat, no glitches. APPLICATION: Drilling hole for PCB, SMT, CNC, Mould, plastic, carbon fiber, wood, printed circuit board, other precision parts processing. 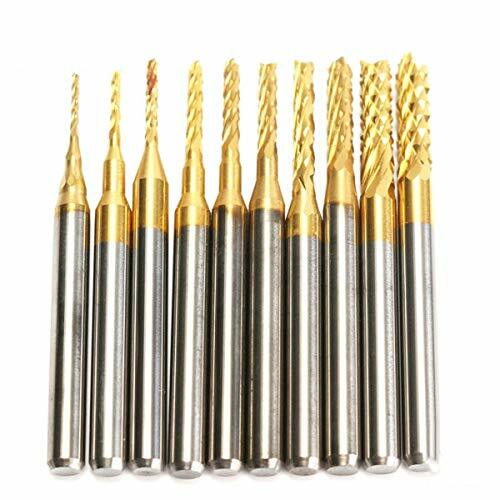 NOTE: NOTE: The end mill CNC bits is designed for hand-held and desktop carpenter machines, can not be used on percussion drills and drilling machines and avoid materials such as copper, iron, sand and stone. 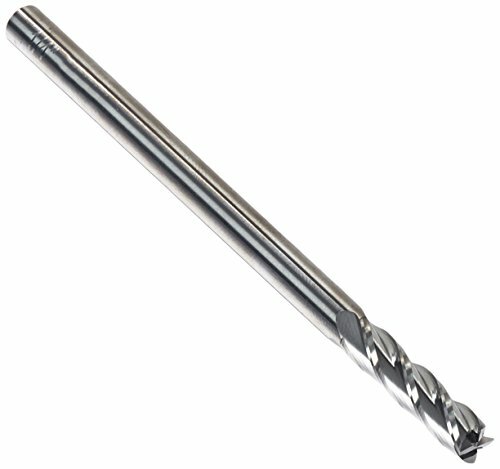 PACKAGE: 10 pieces CNC Rotary Drilling Hole Bit ABOUT "Eaninno" BRAND "Eaninno" is a truly remarkable company, but we are the professional team, selling quality products and providing enthusiastic service is our original intention, we will unswervingly maintain it and make continuous efforts. "Eaninno US" is the only LEGAL SELLER for all "EANINNO" products. 100% risk-free satisfaction guarantee. Any other counterfeit seller can not provide the same quality product and there is no warranty and service. Please be careful not to buy counterfeit products. 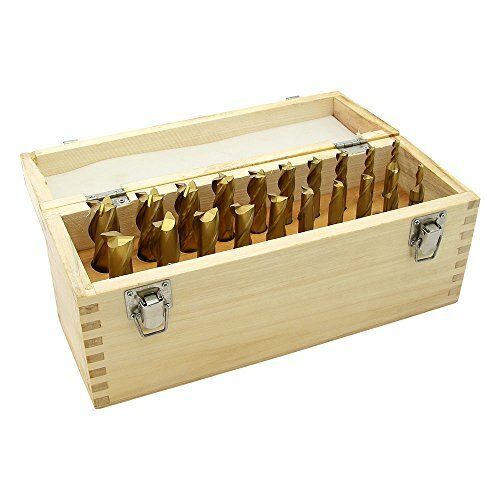 APPLICATION: Carbide PCB Rotary Bits drilling hole tool set work great for PCB, SMT, CNC, Mold, plastic, carbon fiber, wood, printed circuit board, other precision parts processing. 10 CUTTING EDGE DIAMETER: 0.8 - 3.175 mm (0.8, 1.0, 1.2, 1.5, 1.6, 1.8, 2.0, 2.4, 3.0, 3.175 mm). Made of ultra-fine grain carbide material with titanium plating, good milling, high wear resistance, bending resistance, long life of tool. SURFACE CLEAN: Sharp cutting edge and milling groove, clean surface, no burr, enough bending resistance and wear resistance. 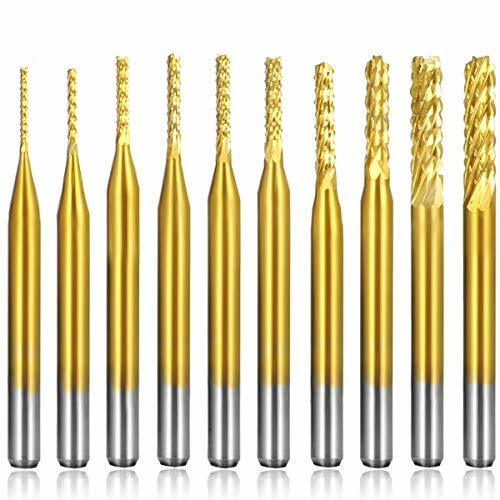 NOTE: The end mill CNC bits is designed for hand-held and desktop carpenter machines, can not be used on percussion drills and drilling machines and avoid materials such as copper, iron, sand and stone. REMINDING -- Eaninno US is the ONLY LEGAL SELLER for all EANINNO products. Any other seller can not provide the same quality product and there is no warranty and service. 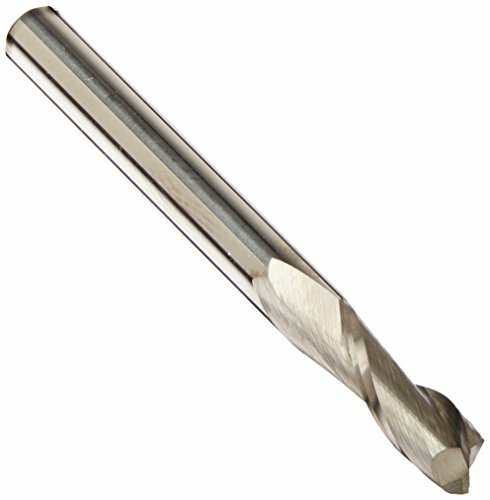 1/4 Inch Diameter Solid Carbide End Mill - Coated 1/4" Shank 1/2" Length of Cut 2" Overall Length 4 Flute Carbide - ALTiN Coated Diameter Tolerance: +.000"/-.002"Shank Diameter Tolerance: -.0001"/-.0004"ALTIN is a high performance coating for milling, tapping and drilling in stainless steels, carbon steels, alloy steels, titanium and cast iron. This coating is extremely heat resistant and can be used with or without coolant. It is exceptional in difficult to machine materials where adhesive wear is particularly high. Made in USA. Single End Center Cutting. 4 Flute. Solid Micrograin Carbide. Style E700. 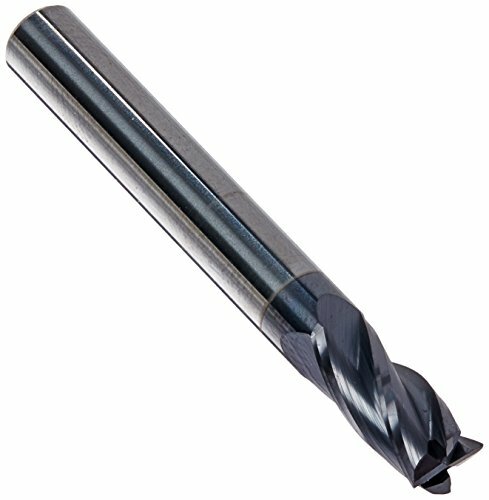 5/16 Inch Diameter Solid Carbide End Mill - Coated 5/16" Shank 1/2" Length of Cut 2" Overall Length 4 Flute Carbide - ALTiN Coated Diameter Tolerance: +.000"/-.002"ALTIN is a high performance coating for milling, tapping and drilling in stainless steels, carbon steels, alloy steels, titanium and cast iron. This coating is extremely heat resistant and can be used with or without coolant. It is exceptional in difficult to machine materials where adhesive wear is particularly high. Diameter: 1/2'', Shank Diameter: 1/2'', Flute length: 1-1/4'', Overall Length: 3-1/4'', 4 Flute, Coarse Tooth TiAlN Coated, Center cutting, M42-8% Premium cobalt, Flutes ground by a world-class IS-9002 Factory, CNC Qualified Produces a smooth finish that often eliminates the need for a finishing cut for profiling and shallow slots. Used for aggressive machining. Performance approaching solid carbide with tough H.S.S Tools. Recommended for abrasive materials. Excellent performance in hard materials that are difficult to cut. Extremely hard, wear resistant. 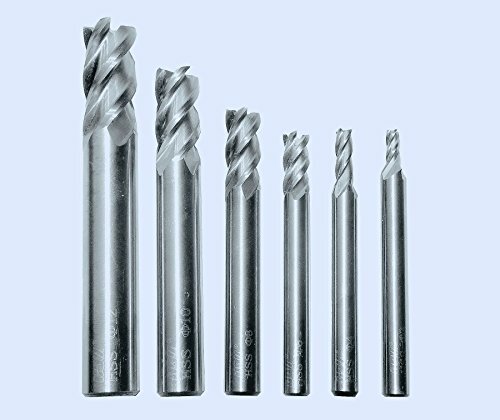 HIGH PROCESSING EFFICIENCY: the edge of end mill bits is HARD and SHARP with TIAIN coating, process the heat treatment materials under 32 with high speed, reduce changing times and improve the production efficiency. 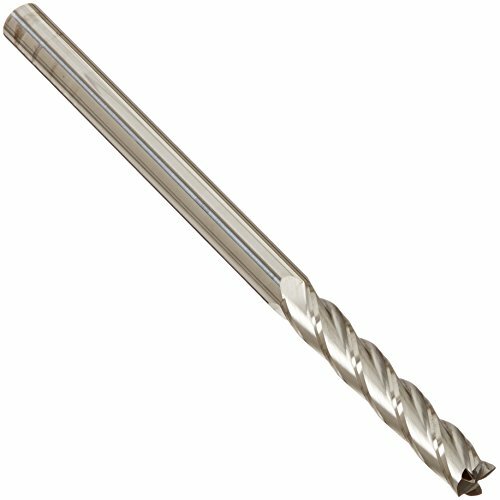 APPLICATION: end mill bits are suitable for side milling, end milling, finish machining, etc. Apply to carbon steel, alloy steel, die steel, tool steel, cast iron, titanium, aluminum, etc. CUTTING EDGE DESIGN: the bottom of end mill bits is u-shaped groove design, large front angle effectively reduces cutting resistance, sharp and durable, convenient for chip removal, further improve machining efficiency. 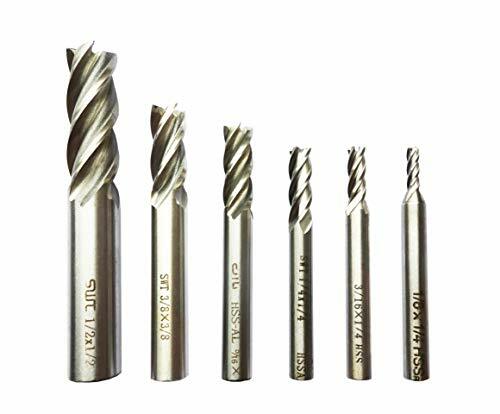 STRONG and DURABLE:The end mill bits are made from Ultra-fine tungsten steel bar, with high bending resistance and abrasion resistance, exclusive to HIGH HARDNESS, HIGH SPEED CUTTING applications. Made in USA. Single End Center Cutting. 4 Flute. Solid Micrograin Carbide. Style E700. Will fit into many routers. End Mill Bits: 1/16" 1/8" 5/32'' 3/16" 1/4" 5/16" 3/8" 1/2"
Center Drill Bits: 1.0" 1.5" 2.0" 2.5" 3.0" 5.0"
Flutes solid carbide coated end mills. It's suit for Hardness of metal for above 30 degrees. Excellent processing technique can let your engraving more stable precise. Combine hard cutter body and high-class cutting edge, not easy to break. Full grinded cutter offer obtain accuracy and fine finish. Widely used in hardness from aluminium, cast iron, brass, copper, magnesium alioy, plastics under HRC32(HRA66), or more processing soft materials. 1/4 Inch Diameter Solid Carbide End Mill - Extra Long 1/4" Shank 1-1/2" Length of Cut 4" Overall Length 4 Flute Carbide - Extra Long Diameter Tolerance: +.000"/-.002"Shank Diameter Tolerance: -.0001"/-.0004". "WEAPONS OF MASS PRODUCTION" Like their uglier cousins the "Gorilla Mills", Primate are standard 2, 3 and 4 flute carbide end mills recommended for machining applications in all materials. Primates have an emphasis on be very cost effective but are still GMP Edge Prepped to hone the cutting edge in a controlled environment to reduce the fracturing that occurs to the cutting edge during the milling process while greatly increasing tool life and enhancing finish. Completely resharpenable, and can be run dry or wet. 1/16 Inch Dia. 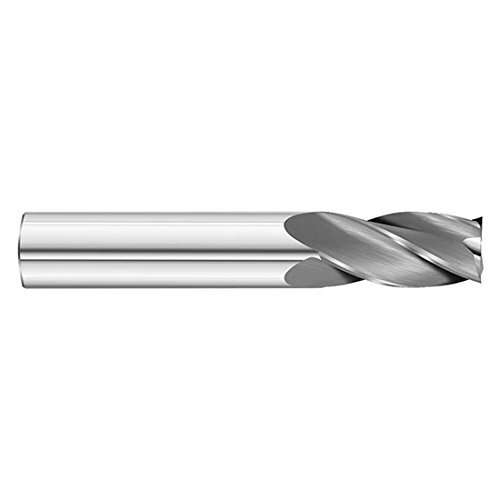 Solid Carbide End Mill - ALTIN Coated 1/8-Shank 1/4 LOC 1-1/2 OAL 4 Flute Carbide - ALTiN Coated Diameter Tolerance: +.000"/-.002"Shank Diameter Tolerance: -.0001"/-.0004"ALTIN is a high performance coating for milling, tapping and drilling in stainless steels, carbon steels, alloy steels, titanium and cast iron. This coating is extremely heat resistant and can be used with or without coolant. It is exceptional in difficult to machine materials where adhesive wear is particularly high. 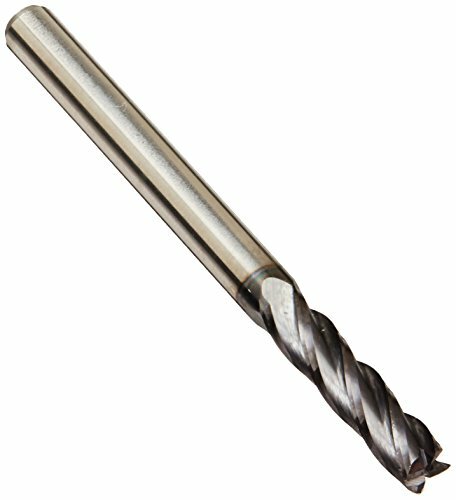 1/8 Inch Diameter Solid Carbide End Mill - ALTIN Coated 1/8" Shank 1/2" Length of Cut 1-1/2" Overall Length 4 Flute Carbide - Coated. 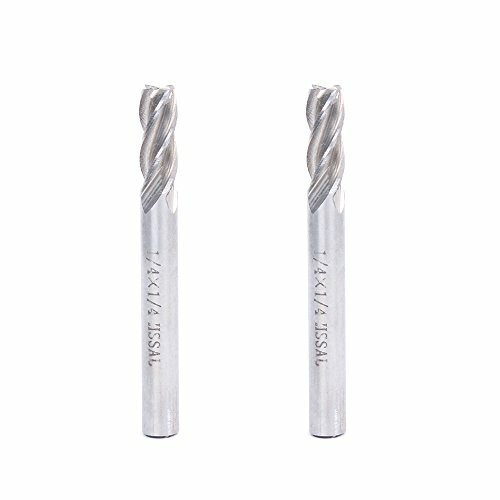 Specification: Product Name : End Mill;Material : HSS Color : Silver HRC:45 degrees Flute: 4 Flute End Mill Bits Cutting Diameter: 1/8"=3mm, 5/32''=4mm, 1/4"=6mm, 5/16"=8mm, 3/8"=10mm, 1/2"=12mm Package Included: 6 x End Mill Bits Usage: End Mill Bits are used for side milling, end milling, finish machining, etc. Apply to wood, steel, stainless steel, alloy steel, carbon steel, die steel, tool steel, cast iron, titanium, aluminum, etc. Why Choose UDK Tools UDKTools strictly require carbide end mills metal and collocate with different graded coating.The choice of grinding machine equipment and supervision of external diameter tolerance and diameter tolerance can improve the stability of the tools. We has produced the carbide end mills with conscientious attitudes many years. Bset Service,Excellent Quality,Satisfied Customers and Good Cooperation are our targets.